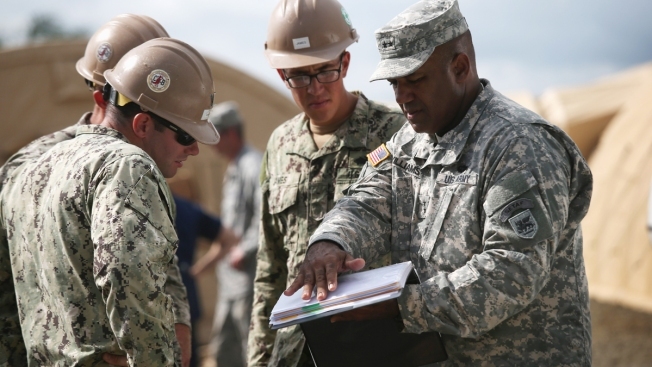 In this 2014 file photo, then-Maj. Gen. Darryl Williams, who was the commanding general of U.S. Army Africa, speaks to U.S. Navy Seabees at the construction site of a 25-bed hospital for Liberian health workers in Monrovia, Liberia. Lt. Gen. Darryl A. Williams, a 1983 U.S. Military Academy graduate who has held high-ranking Army posts in Europe and Asia, will become the first black officer to command West Point in its 216-year history, academy officials announced Friday. Williams will assume command as the academy's 60th superintendent during a ceremony Monday morning in West Point's Jefferson Hall, school officials said. The native of Alexandria, Virginia, has served as the deputy chief of staff for the U.S. Army in Europe and the deputy commanding general for support for the 2nd Infantry Division in South Korea. Most recently Williams was commander of NATO's Allied Land Command, based in Turkey. West Point, founded in 1802 along the west bank of the Hudson River 50 miles (80 kilometers) north of New York City, didn't graduate its first black cadet until the Reconstruction in 1877. No black cadet had graduated in the 20th century when Benjamin O. Davis Jr. arrived in there in 1932. Davis ate alone, roomed alone and was shunned by fellow cadets because he was black. After graduating in 1936, he went on to command the Tuskegee Airmen during World War II and retired as an Air Force general in 1970. West Point recently named its newest cadet barracks for Davis. The announcement of Williams' appointment comes less than a year after an African-American cadet and Rhodes Scholar was selected to take the top position in West Point's cadet chain of command. Simone Askew, of Fairfax, Virginia, was selected first captain of the Corps of Cadets last summer and graduated in May. The academy recently announced that the more than 1,200-member incoming class of 2020 includes 186 African-Americans. Williams takes over from Lt. Gen. Robert L. Caslen Jr., who's retiring after more than 40 years in the Army, including the last five years as West Point's superintendent.